Over a 15-year history, RUAG has developed rapidly through M&A and internationalization. As a consequence of the investments in various technology, space and defense companies, the RUAG IT landscape has grown more and more complex. In 2014 RUAG operated over 150 ERP-like systems and 17 SAP instances. The lack of transparency, especially on related risks, had become a major concern of the management. 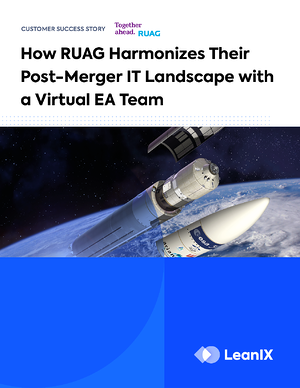 RUAG needed to establish a unified IT inventory quickly to achieve an overview of the complete IT landscape of the company. Establishment of transparency was the crucial first step to enable all further activities.